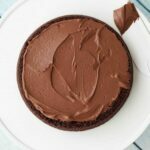 Ever since I made my classic vegan chocolate cake I’ve been keen to try a gluten-free chocolate cake. And I had lovely little rainbows and pixie dust in my head when I attempted it, thinking all I had to do was switch out the all purpose flour for a gluten free option and it would be perfect. So since I had a ready bag of rice flour I happily went along following my chocolate cake recipe to the T, just switching out the flours, expecting a glorious cake to result. Ha Ha Ha Ha! What a laugh. What happened instead is I got my first cake explosion! Well, maybe that’s a bit sensationalist, as it didn’t explode in the oven or anything. Rather what happened was as soon as it was out of the cake tins it started to break apart. But I, pixie dust and rainbows rapidly disappearing, set out to frost it into shape! I would frost it so well it would certainly hold together. Frosting complete, I put it into the refrigerator to set, thinking once that frosting set there would be no falling apart of this cake. And that’s when the explosion happened. The cake literally exploded outwards (thank god it was in a cake container, else my fridge would have been a sight) into huge chunks of frosted cake. So wish I had taken a picture so I could show you the carnage! We still ate it though, it tasted like a brownie cake, and aside from the fact that you had to dish it up with a spoon into bowls and eat it like a brownie pudding, it was still very tasty. So now I thought I had learned my lesson – so you can’t just use any gluten-free flour as a substitute then! So I went out and bought a gluten-free all purpose flour blend. And my next attempt used this flour as a direct substitute and again followed my previous recipe to a T.
Ag. Dry. As dry as the Sahara was the result! So I finally did what I should have done in the beginning and researched gluten-free cake baking a bit more. After doing some research I quickly discovered that yes, gluten-free flours absorb more moisture, so you should increase wet ingredients! And on top of that you might want to consider increasing ingredients like baking powder or baking soda by 25% too. So I increased the oil, added some applesauce, switched out the white sugar for brown (more moisture in brown sugar), and added 25% more to the baking soda and bingo, the best, perfectly moist, perfectly delicious gluten-free cake that you would never even know is gluten-free. Yay! And topped with some vegan ganache frosting, this was a cake that made a lot of people very happy I can tell you! Which gluten-free all purpose baking flour is the best? 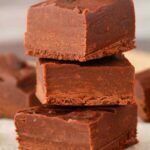 Since I first made this recipe I have tried out quite a few blends and all have worked great! Some have had xantham gum in there as an ingredient, some have not. But the only way this recipe works is if you use a gluten-free all purpose flour blend that is designed to be used in place of regular flour. If you do what I did on my first try and use rice flour or almond flour or coconut flour or something like that, it will NOT work. So don’t waste your ingredients. 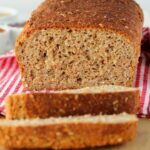 I am a fan of Bob’s Red Mill brand of gluten-free baking flours and have used the Gluten-Free All Purpose Baking Flour and the Gluten-Free 1:1 Baking Flour, both will work great with this recipe. But I have also used lesser known brands and they have also worked great. So it’s my opinion that as long as it’s a blend meant for baking, you’re going to be good with this. Parchment paper circles are a must! Another thing I learned in my gluten-free cake baking experience was that you really want to use some parchment paper here. In previous cakes I just greased my cake pans and got on with it, but I totally ruined one of my gluten-free chocolate cakes by doing this. It stuck to the bottom of the pan, and while I can usually loosen it with a knife, with this cake, being more crumbly than a regular cake, it broke up in the process and was utterly destroyed. Cutting parchment paper into a circle and putting that on the bottom of the greased pan solved that problem perfectly. Cake came right out with no possibility of breaking up while doing so. So I’m mightily pleased with this gluten-free chocolate cake, this recipe now works extremely well with all the kinks worked out of it! 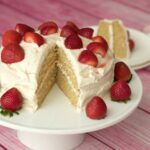 Gluten-free baking isn’t quite as easy as regular baking (and even regular baking I think we’ll all agree takes a bit of experience), and you have to be open to tweaking things as necessary. 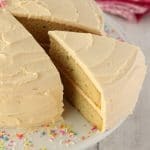 You’ll love how this cake comes out and if you’re eating gluten-free or baking for someone who is, this cake is going to be quite the people-pleaser. 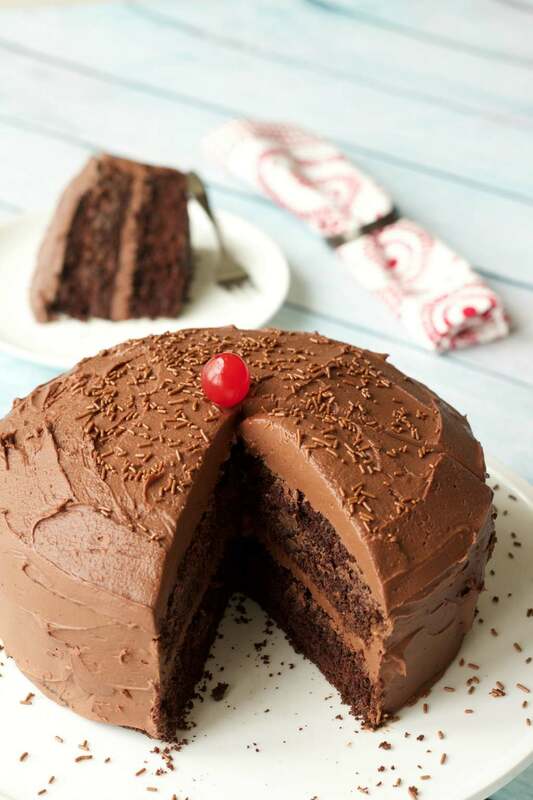 It’s perfectly moist, ultra-chocolatey, and no one will even know it’s gluten-free. Another little tip I picked up in my research was that gluten-free baking times can vary from standard times. With this cake (since I had to make it quite a few times to get it right! ), I found that 30 minutes was adequate most of the time, except on one occasion when the toothpick came out a little wet at 30 minutes, and I put it back in for another 5 minutes after which it was fine. So – be a little flexible. Actually flexibility in baking is kind of required, since oven temperatures vary anyway. So check it after 30 minutes and it will likely be done, but if not, put it back in a little longer. 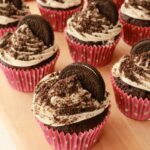 So let us know what you think of this recipe by leaving a comment and rating the recipe too please! 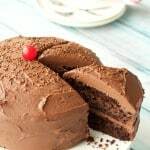 And share this recipe far and wide if you have any gluten-free friends or family who might appreciate a fabulous gluten-free chocolate cake. Thanks! 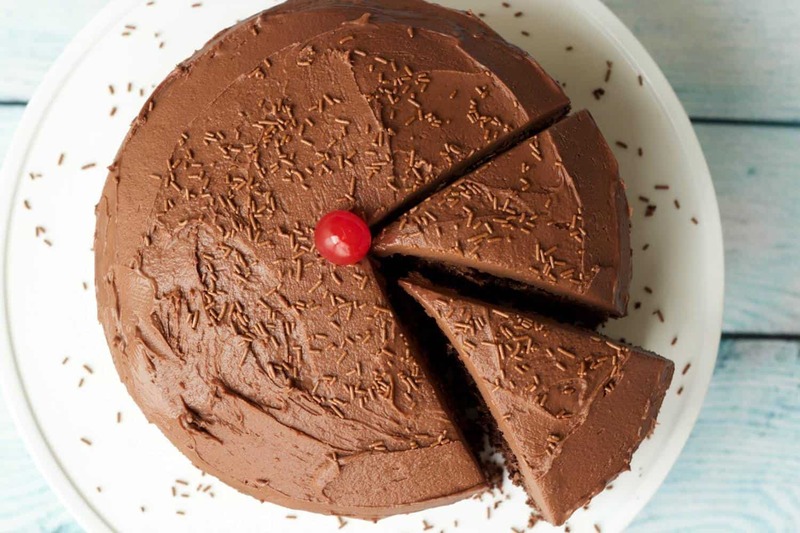 Gorgeous 2-layer moist and delicious vegan and gluten-free chocolate cake. 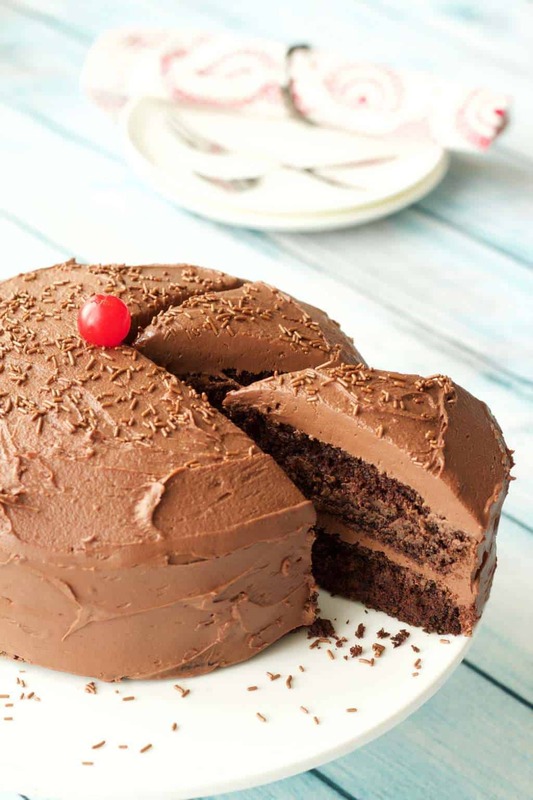 Frosted with a rich and creamy chocolate ganache frosting this cake is ideal for any special occasion. Preheat the oven to 350°F (or 180°C). Grease two 7-inch round cake tins with coconut oil or non-stick spray and cut out two circles of parchment paper to line the bottoms. 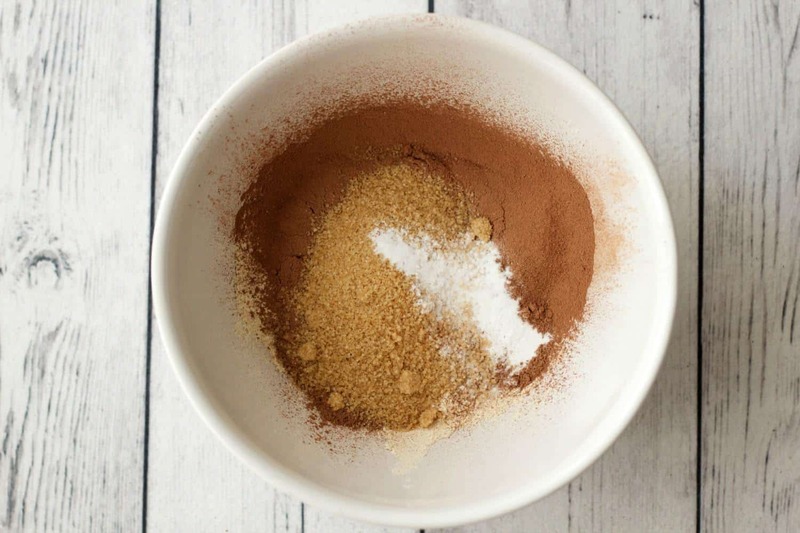 Sift the gluten free flour and cocoa powder into a mixing bowl. 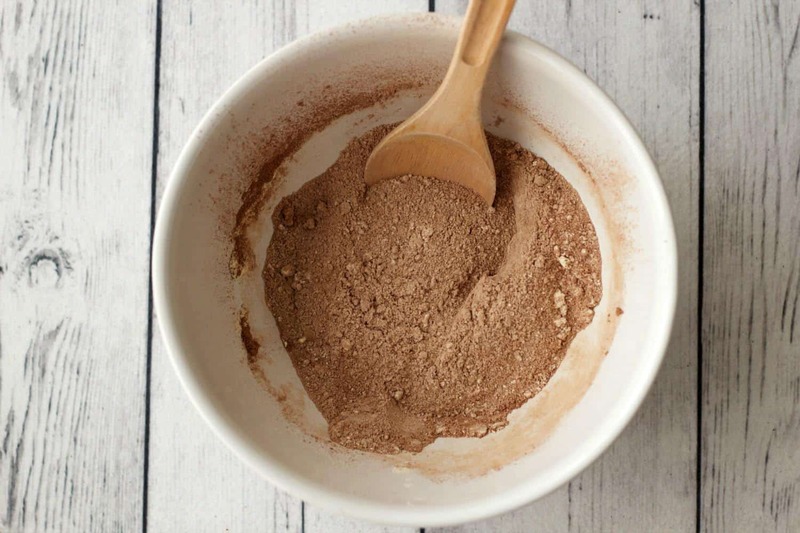 Prepare the flax egg by mixing 1 Tbsp ground flaxseed meal with 3 Tbsp Hot Water and allowing to sit for a minute. 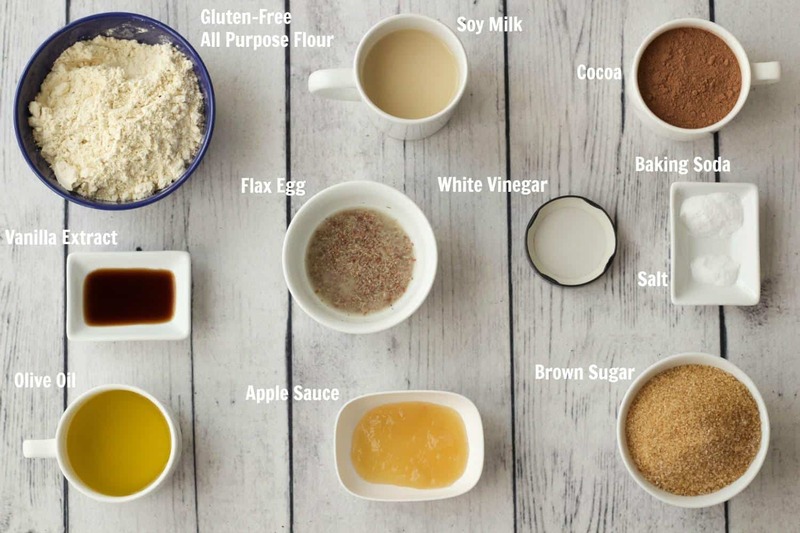 Pour in the soy milk (or other non-dairy milk), vanilla extract, olive oil, white vinegar and applesauce and mix. Add the flax egg and mix in. Divide the batter between the two cake pans and place into the oven to bake for 30 minutes. After 30 minutes check if they are ready by inserting a toothpick into the center of the cake. If it comes out clean it’s ready. If not, put it back in for another 5 minutes and then check again. Move to a cooling rack and allow to cool completely before frosting. Prepare the chocolate ganache frosting by adding the coconut cream and coconut oil to a pot on the stove and heating to just prior to boiling (it should have just started to simmer). Remove from the stove and pour out the hot liquid over broken up pieces of dark chocolate in a bowl. Allow to sit for a minute for the chocolate to melt. Whisk up into smooth chocolate. Add 2 cups of powdered sugar and whisk again with an electric whisk. Place the chocolate ganache into the refrigerator to firm up for about an hour, this will be when the cake is cooling anyway. When the frosting is cooled and firm, whisk it up again with an electric whisk until it’s the right consistency to spread onto cake. 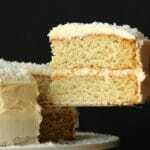 If it’s too thin, add another 1/2 cup of powdered sugar to reach the right frosting consistency. Frost onto the cooled cake. This cake will keep properly covered in a cake dish for a few days, but of course it’s best when fresh. *I used Bob’s Red Mill Gluten Free All Purpose Flour Blend in this recipe. *You can switch the oil for canola oil or another vegetable oil of your choice. If you want to use coconut oil then make sure it’s melted first. 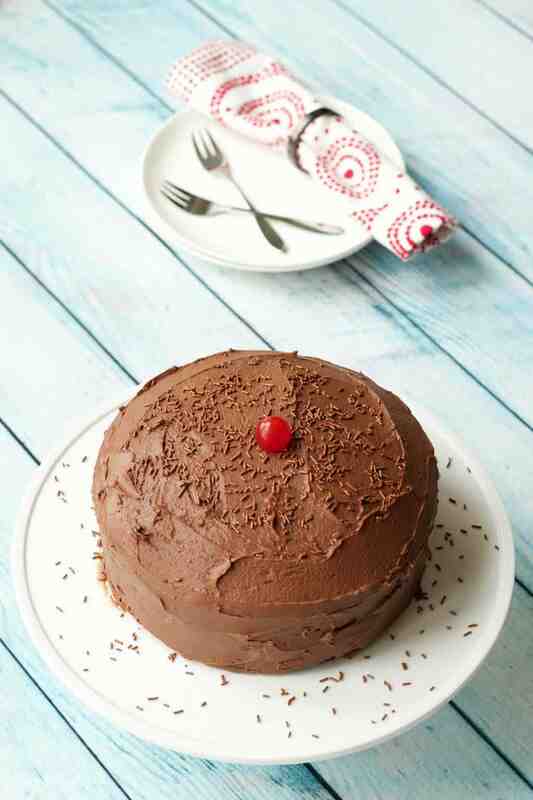 *Adapted from my Classic Vegan Chocolate Cake recipe. *Prep time is for cake only and does not include the chocolate ganache frosting. *Nutrition estimate is based on 1 slice of 10 with a generous (very generous) amount of vegan chocolate ganache frosting. Made this yesterday for an aunt’s 60th birthday and made a few substitutions. 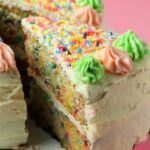 I wanted thicker layers for the cake and made 1.5 times this recipe to bake 2 6-inch rounds. It baked for an extra 10-12minutes. I used organic grapeseed oil instead of olive oil and omitted apple sauce. I also added 2tbsp liquid espresso to bring out the chocolate flavor more. 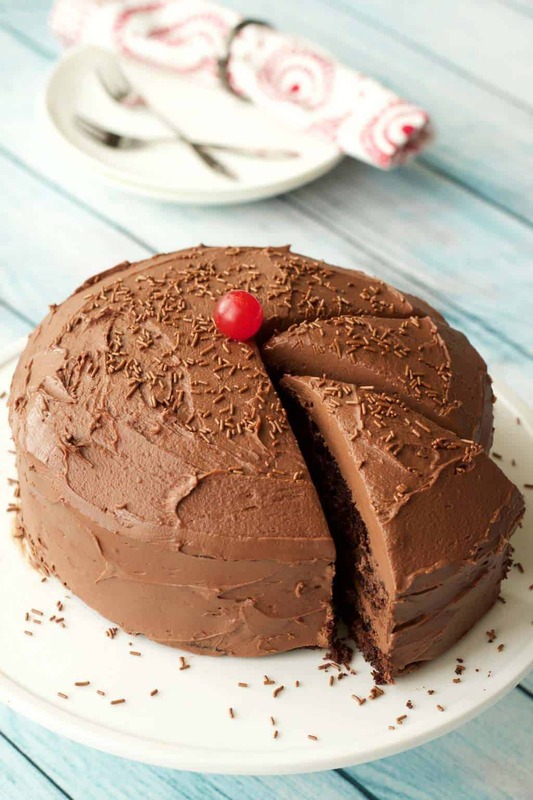 The batter baked perfectly, and the cake did not dip in the middle. Served it with your coconut chocolate ganache and added some ghirardelli’s dark chocolate salted caramel pieces for non-vegans.. Everyone LOVED it. Thank you so much!!! Best GF cake I’ve made. Still tastes good a few days later too, which is rare with GF baked goods. Didn’t have time to make frosting so cooked cake with mini chocolate chips in the batter. Otherwise followed directions exactly. My food allergy kids loved it and me too. Yum, thanks!! Hi, What can I use instead of the flax egg I’m wondering? Has anyone tried something else? You can try applesauce instead, 3 Tbsp to replace the flax egg, or you can make a chia egg which is made the same way as a flax egg. You might try banana, also. I love this recipe. It has my vegan, gluten free friends questioning me over and over if they can actually eat it because it’s so delicious! Thank you! Question, can the cake part be made a day in advance? 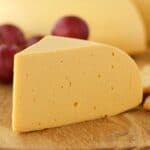 Does the texture and flavor diminish at all? That is so awesome to hear! Thanks for the awesome review! You can definitely make it the day before, I don’t think you will have any diminishing flavor or texture at all after just one day. One more question, do you think this cake would do well being cut into layers horizontally? 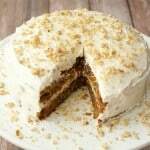 Or do you recommend baking the layers separately? I was thinking to double the recipe and use two 9” pans and cut them to make 4 layers total.